There was smoke across the sky, a trail of red smoke wound in a tight spiral coil. At the center of the coil was the source of the fire: a double star. One member was violet-white, a flame to brand holes in a human retina, its force held in check by the polarized window. The companion was small and yellow. They seemed to burn inches apart, so close that their masses had pulled them both into flattened eggs, so close that a red belt of lesser flame looped around them to link their bulging equators togehter. The belt was hydrogen, still mating in fusion fire, pulled loose from the stellar surfaces by two gravitional wells in conflict. The gravity did more than that. It sent a loose end of the red belt flailing away, away and out in a burning Maypole spiral that expanded and dimmed as it rose toward interstellar space, until it turned from flame-red to smoke-red, bracketing the sky and painting a spiral path of stars deep red across half the universe. Now take a look at this recent Hubble Telescope image showing a thin spiral pattern wound around a hidden star. The spiral pattern suggests a regular periodic origin for the nebula’s shape. The material forming the spiral is moving outwards a speed of about 50 000 km/hour and, by combining this speed with the distance between layers, astronomers calculate that the shells are each separated by about 800 years. 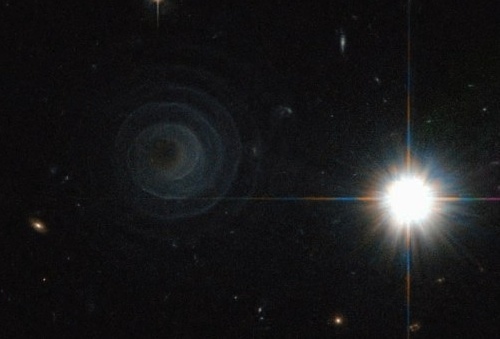 The spiral is thought to arise because LL Pegasi is a binary system, with the star that is losing material and a companion star orbiting each other. The spacing between layers in the spiral is expected to directly reflect the orbital period of the binary, which is indeed estimated to be also about 800 years. Leave it to science fiction writers to present a picture of the universe long before the actual photo is available. From Hubble via Behind the Black; thanks to Winchell Chung for pointing this one out.